The items for the bottom of a horse's stall are all chosen for a specific purpose. Horse stall floors consist of either a porous or nonporous barn floor, an optional stable mat and removable bedding placed on the top layer. Each item contributes to a horse's health and comfort. Since horses spend the majority of their time standing or resting in their stalls, they need a clean environment for optimal health. Horse stalls must provide good drainage, since dampness can contribute to hoof problems that can cause lameness. Understanding what goes into the bottom of a horse's stall and why each item is chosen will help you provide the best care for your horses. At the very bottom of a horse's stall is the stable floor itself. Stable floors are either porous or nonporous. Porous flooring consists of dirt, gravel, sand or a layer of each, and allows for good drainage. 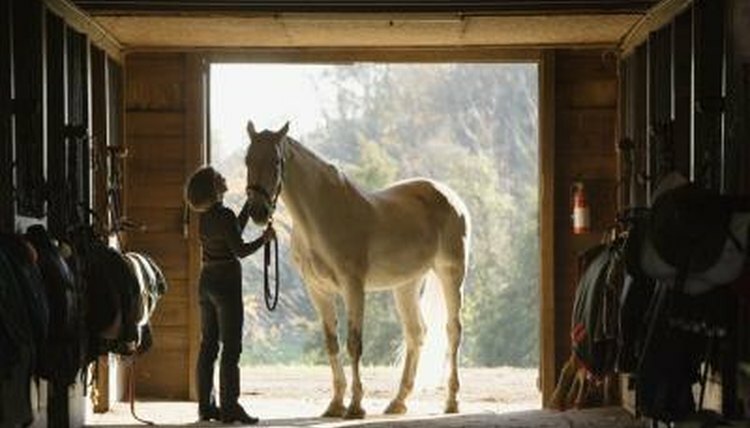 Wooden floors may also be found in horse barns. Nonporous floors are typically made from poured concrete. Porous floors are often better for horses because they provide cushioning, offer a dry environment and prevent slips. Concrete floors are easier to clean and require less maintenance than porous floors, but are often harder on a horse's legs and feet. They can also be slippery unless the concrete is textured in some way to offer traction. Either a stall mat or horse bedding is placed over the floor itself. Stall mats are rubber or plastic floor mats that are placed over the stall floor in the next layer above the barn's floor. They are typically used in stalls with concrete floors or very hard porous materials. Stall mats provide cushioning for horses as they stand on the hard concrete floor. This feature also reduces the amount of bedding needed in the stall since the mats already provide a layer of cushioning. Textured mats may help prevent horses from slipping on a concrete floor. They vary in thickness from 1/2 inch to 3/4 inch, and are placed over a level floor. They can be placed over concrete, gravel or dirt flooring. Some type of stall bedding is always placed over a stall mat. Hay or straw bedding is a traditional choice for the top layer of a horse's stall floor. They are renewable resources, and easy to clean and remove when soiled. They are often inexpensive; farms can grow their own straw or hay, or use materials delivered as horse feed. The drawback to hay and stray bedding is that horses will often eat their bedding and ingest soiled hay or straw that has been contaminated with mouse, rat or opossum droppings, a source of potential infections such as equine protozoal myeloencephalitis. Old hay or straw that is used as bedding may also be dusty and contribute to respiratory problems in some horses. Wood shavings are another traditional choice for stall bedding materials. Pine shavings are the most common. These can be delivered in bulk or in bags. Wood shavings provide good cushioning for horses, absorb urine readily and are easy to clean. They can be expensive, and if the bedding material gets wet during transportation or storage you should not use it in the horse's stall. Wood shavings may also contain unwanted objects such as metal fragments from factories or black walnut, which if ingested can cause a disease in horses called laminitis. One of the newest materials on the market to cover a horse's stall floor is recycled paper products such as newspaper, cardboard and other paper. It tends to be highly absorbent and provides good cushioning for horses. It is also lightweight when dry, another plus for those who have to clean the horse's stall and move bedding materials from storage to stall. Another benefit is that the entire stall bedding can be composted, and it breaks down quickly when added to a compost or manure pile. It can be heavy when soiled or wet, and the ink may cause a reaction in some horses.